An aerospace business in Broughton, which was as set up in the aftermath of the closure of Marshall Aviation Services, is celebrating after winning a new contract with a leading company. 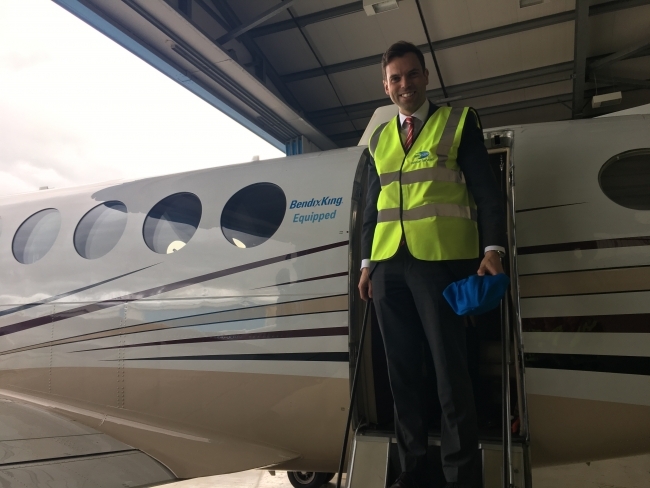 Aerocare Aviation Services have been appointed UK dealer and preferred installer in the UK and parts of Northern Europe for Bendix King’s new state of the art glass cockpit, which is a further boost for the company established in 2017. The core business for Aerocare is the maintenance, repair, overhaul, modification and refurbishment of business aircraft. They offer a complete package including avionics and paint spraying, while interior refurbishments are carried out to very high standards for the luxury end of the business. The company was spearheaded by the former General Manager at Marshall’s, initially employing 28 former workers, many of whom were assisted by the Welsh Government’s ReAct programme. They went on to employ a total of 40 former Marshall employees and now the company has grown to 60 staff with a turnover of £7m. Welsh Government Minister for Economy, Ken Skates said: “Aerocare are very much a phoenix company. They have risen from the disappointment of the closure of Marshall, retained some of the skilled workforce with Welsh Government assistance, and are a real success story. “The Welsh Government will continue to do all it can to support the industry as we face the challenges ahead. Our commitment to the industry can be seen through our £20m investment in the Advanced Manufacturing and Research Centre nearby and our backing for business through the Business Resilience Fund.